ROBERTSON, who started recording in 1922, and who you can learn about through this biography page on oldtimemusic.com, might disagree). By the 1920s must music fans became familiar with the instruments most often used in Appalachia, such as the fiddle (introduced by British/Irish immigrants), the guitar (introduced by Spanish immigrants), the mandolin (an Italian version of the ancient lute), the fretted dulcimer (introduced by Germans and other Northern Europeans), and the banjo, which became one of the instruments most identified with music of the American mountains, but has its origins in Africa. folk ensemble without one. “The fiddle” was always a bit less reputable than its classical cousin, “the violin”–in fact, the two instruments are exactly the same, the only difference is the approach of the musician. American fiddle players diverged from their European and even their Canadian fellows as they picked up African-American phrasing and syncopation. Though the mandolin, Italy’s regional variant of the ancient and widespread lute, started to appear in the United States as early as the 1850s, many Italian immigrants brought their mandolins with them when they immigrated to America in the 1880s. At the turn of the 20th century the mandolin was a familiar Vaudeville instrument, and also became popular among the middle class youth on college campuses and in towns throughout the South, though inthe ’30s and ’40s bluegrass pioneer Bill Monroe, who we’ll introduce below, was the first mandolin virtuoso to take the instrument to the country music-loving masses. Though it has fallen out of favor in recent years, the dulcimer, first introduced by German and other Northern European immigrants in the 19th century, the dulcimer was a standard “hillbilly” instrument for generations. It was most popular in rural communities on the eastern side of the Appalachian mountains and in the South. One of the instruments most closely associated with music from the Appalachians, and therefore most closely associated with the music of rural whites, is the banjo. but the banjo is actually an instrument that originated in Africa. Early banjos first appeared in the colonies most active in the African slave trade in the late 1600s. Known at first by other names such as the banza and the strum-strum, the name “banjo” arrived in the late 1700s and took about fifty years, until the 1840s, to stick. In the early 1900s “minstrel shows,” which we met above, featured banjos in their imitations of life on the plantation, introducing it to white musicians who quickly embraced it, adopting it as an instrument central to mountain music. Okay, back to the chronology. “Country” music developed into a national genre in the early 20th century when the hillbilly/mountain/old-time music of Appalachia and the Southeastern U.S. traveled westward, either in the person of itinerant musicians or due to the migration of music fans. At the time Americans still considered the Southwest (Texas, Oklahoma and states nearby) very much part of a wild frontier. Whether or not there were actually still many roaming, hard-living cowboys, the image of the lone man–and his lone horse–living, and singing about, a rough but honorable life, was a romantic one. Still, even as country music developed into one of the most distinctly American of American art forms, the genre owes a substantial debt to music and culture from abroad. In 1924 Georgia guitarist Riley Puckett introduced yodeling, a vocal style from Swiss and Austrian Alps, in his song, Rock All Our Babies To Sleep. In 1927 fellow country yodeler JIMMIE ROGERS embraced the Hawaiian slide guitar and applied the sound to songs like T For Texas which straddled the line between folk and blues. In the 1920s an African-American musician named HUDDIE LEDBETTER (a.k.a. “LEADBELLY”) embodied all the contemporary trends in folk music at once with his genre-bending “folk-blues” songs that were as much gospel as they were country. Ledbetter was born on a Louisiana plantation, moved to Texas with his family when he was a youth, worked in the cotton fields and regularly ran afoul of the law, though, according to legend, he earned pardons from two different prison sentences by appealing to the authorities through his songs. In the latter part of his life Leadbelly was part of the political folk scene in New York, cavorting with and directly influencing, a couple characters we’ll meet later–Woody Guthrie and Pete Seeger. In the 1930s the global economy collapsed and the world fell into the abysmal Great Depression. The economic devastation touched everyone, but it hit in the Great Plains in physical form. About a hundred million acres of land in the Plains, a vast tract covering the panhandles ofÂ Oklahoma and Texas as well as parts of New Mexico, Colorado and Kansas, had been so overly and unwisely farmed that a mid ’30s drought and a concurrent set of windstorms kicked up the dusty top soil and blew it upward, darkening the sky. Add the environmental disaster to the fact that in this “Dust Bowl” there were next to no jobs and you’ll understand why so many Western families emigrated from the area elsewhere–mainly to California–to build a new life. 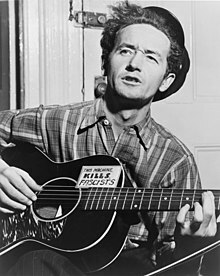 One of these Dust Bowl-born, California-bound job seekers was a politically astute singer-songwriter named WOODY GUTHRIE. Son of an Okemah, Oklahoma businessman, Guthrie’s family faced a seemingly unending string of tragedies–devastating fires, debilitating disease–that made life a struggle even before the dust storms hit. When Guthrie was in his early ’20s–already married with three children–he left home to go westward seeking work. Guthrie brought his guitar with him on his travels and made more money playing songs he wrote than working any kind of odd job. communism, and while he wasn’t active in any one group he did inspire generations of activists through his frank, insightful and wryly clever pro-worker, anti-war, deeply human lyrics. In the late ’20s and early ’30s a singing trio from Virginia, THE CARTER FAMILY, applied tight mountain gospel and shape-note singing harmonies to traditional folk ballads and almost single-handedly created and codified the canon of American traditional country music. The ensemble was composed initially of Sarah, Maybelle and A.P. Carter, but remained popular for over forty years, changing personnel each decade or so as generations of Carter children, including JUNE CARTER, who went on to partner with country legend Johnny Cash, joined the group. Widely acknowledged as “The First Family of Country Music,” the beloved Carters continue to inspire American country and folk musicians to this day. During the 1930s and ’40s Hollywood romanticized the disappearing Old West in a series of movies and television series’ featuring singing “cowboys” like GENE AUTRY and ROY ROGERS. These cinematic cowboys sang “Western music” that popularized horse riding and hard working yet honest cowboy living, creating an escape for audiences during the hard times of the Depression and second World War. In the early 1930s, while Oklahoman Woody Guthrie was bringing Western folk ballads to the boys back East, fiddler BOB WILLS and his band, the Oklahoma-based “Texas Playboys,” blended rural country and Western music with both Eastern and New Orleans big band jazz to pioneer a genre that became known as Western Swing. By the middle of the decade Wills had added horns, reeds and drums to the Playboys, not completely erasing the line between “white” and “black” music, but liberally blurring it.